One room Cabins include beds and have kitchen facilities. Running water up to the cabin. Cottages are fully modern with a 3 piece bathroom, galley kitchen, one bedroom with queen beds as well as a dining/livingroom combine. In the living room is a double sofa bed. All units are a two night minimun stay. 40 km north of Burns Lake. 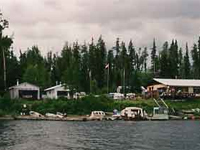 Located in Northern British Columbia, on Babine Lake. 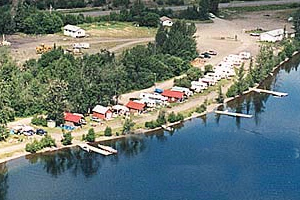 Babine Lake, which has the title of longest, fresh water lake in British Colombia, stretching 177 km (110 mi) from point to point. 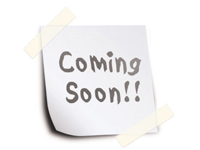 We have cabins, camping and rv parking. 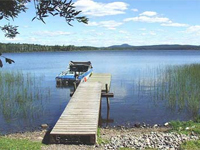 Our lodge carries some supplies and there is boat rentals. Hunting, fishing and just to relax our resort is just what you're looking for. The name 'Takysie' means 'lake of many fishes' The abundance of Takysie Lake fish will excite even the non-fisherman as each day the fish rise and leap from the water for their daily meal. Listen to the call of the loons. Watch the eagles soar overhead. Tour the lake in one of our aluminum boats to view an eagle's nest or catch your next meal. Our lakeside resort is secluded with a peaceful tranquility that's difficult to find. Wistaria Manor is a drive to location located 80 Km south of Burns Lake, British Columbia, Canada. We are about 250 km west of Prince George, B.C. which has a major airport with car rentals. The alternate airport is 200 Km away in Smithers, B.C. with same amenities. For non jet service airports, there is a paved airport in Burns Lake or a small grass airstrip on a neighbors ranch.